Please click google + above if you can. 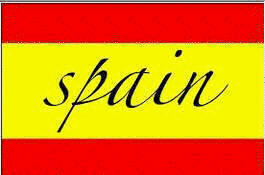 Click above for Discounted prices of Hotels Apartments, Guest Houses and Villas in Spain. 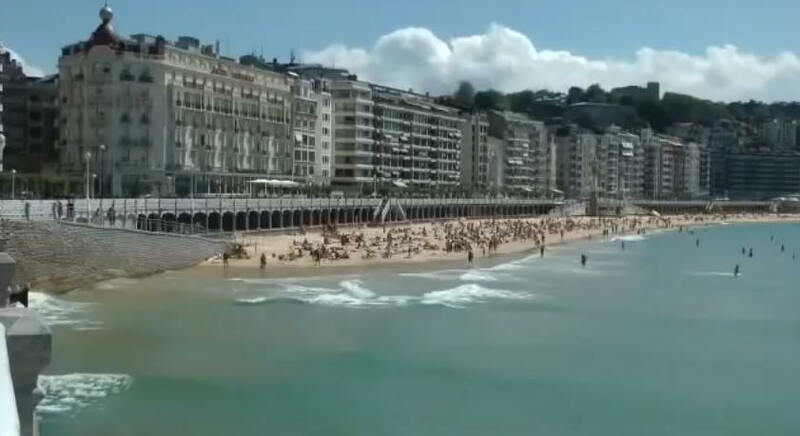 One of the highlights of Spain's Basque country, San Sebastian is also known as 'Donostia' and stands on the northern coastline, close to the French border. San Sebastian is centred around the beautiful La Concha Bay and is a sophisticated area, with San Sebastian featuring a scenic backdrop of hills from the nearby Guipuzcoa area. With appealing and spacious avenues, San Sebastian offers a certain elegance and grace, which is unusual for a seaside resort. 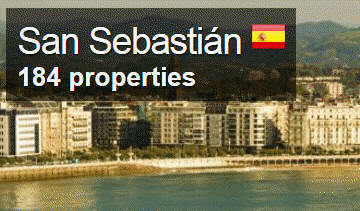 San Sebastian features four main beaches, all of which are suitable for a range of water sports, including surfing. Both old and new abound throughout San Sebastian, with a host of restaurants specialising in local Basque cuisine, together with many lively Tapas bars, particularly around the Old Quarter district (Parte Vieja). Other notable regions of San Sebastian, include the coastal Gros district, Zona Romantica and the downtown area - a particularly lively part of San Sebastian, home to a grand cathedral and a number of excellent shopping streets. Tourism is actively encouraged all over San Sebastian, with the city's main tourist information bureau being the Centro de Attraction y Turismo along the Boulevard Reina Regente. Here you will find a good selection of tourism advice, colourful leaflets and information about the best places to eat, stay and visit. 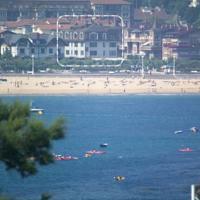 Hotels are in good supply in San Sebastian, quickly becoming fully booked during the city's Easter festivities and summer season. Both hotels in the city centre and along the coastline are popular, with many visitors choose accommodation overlooking La Concha beach. Further hotels can be found in and around San Sebastian's Old Quarter - where inexpensive guest houses are plentiful, alongside the river, on the city's outskirts, and in neighbouring towns. San Sebastian's main tourist attractions include the Palacio del Mar/Aquarium - a major aquarium complex, featuring many tanks of colourful fish and an underwater tunnel; Funicular Railway - a short and inexpensive ride up a particularly steep cliff, offering superb views La Concha Bay; Monte Igeldo Amusement Park - with a number of roller coasters and fast rides, known locally in San Sebastian as the 'Parque de Atracciiones'; Kursaal Conference Centre - a somewhat controversial building, with modern architecture and an extensive calendar of events; Parte Vieja - a popular shopping district in the centre of San Sebastian's Historic Quarter; Plaza de la Constitucion - an important public square, surrounded by historical buildings, including the old town hall (ayuntamiento); San Sebastian Port 'El Puerto', a bustling port with many waterfront tourist attractions and restaurants; and Teatro Principal - a medium-sized theatre in San Sebastian, accommodating around 500 people, with many regular performances and concerts. Top landmarks and further tourist attractions in San Sebastian include the Ayuntamiento - San Sebastian City Hall, a grand sandstone building dating back to the late 19th century; Municipal Library - the 'Biblioteca Municipal', San Sebastian's old City Hall, now used as a public library, with many important local documents; Castillo de Santa Cruz de la Mota - a particularly historic fortress, known to have originated over 800 years ago; Murallas del Puerto - 16th century remains of San Sebastian's Port Walls; Palacio de Justica - a magnificent building housing the San Sebastian Courts of Law; Puente de Santa Catalina - San Sebastian's oldest bridge, a Neo-classical structure built in the 1870's and Palacio de Miramar - a beautiful palace featuring superb landscaped gardens. 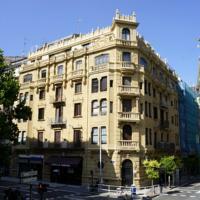 Some of San Sebastian's main museums and art galleries include the Itsas Marine Museum - featuring educational information and displays about marine life, including recreations of whole ecosystems; Museo Naval - the Naval Museum, containing many large collections and historic information about the San Sebastian Port; Galeria Altxerri - with exhibitions of paintings and sculptures by many notable local artists; Koldo Mitzelena Arts Centre - an eye-catching building, complete with conference hall and an art exhibition, hosting many of San Sebastian's top events; and Museo San Telmo - the San Telmo Museum, home to a large number of impresssive paintings with Spanish origins. Tourist attractions located nearby San Sebastian include Bilbao - an important city situated to the west of San Sebastian, with a population of more than 350,000 and many world-class tourist attractions, together with historical landmarks and spacious plazas; Santander - located in Spain's Canabria area, to the west of San Sebastian, known for its impressive Roman heritage and bustling port; Zaragoza - a truly cosmopolitan city which can be reached in around two and a half hours, with a population exceeding 600,000, making it the fifth-largest city in Spain; Getaria - a busy port town close to San Sebastian, with a rich medieval heritage; the town of Hondarribia - best known for its magnificent town hall, which dates back to the 18th century; Pasala - a coastal village, with origins in the 12th century and many water-based leisure activities; and the Medieval village of Zarautz - a popular excursion from San Sebastian, featuring a beachfront and a range of water sports. Cape Verde popularity to soar Cape Verde Islands http://www.daydreamvillas.co.uk/cape-verde/cape-verde-islands.htm Come find tropical gardens.